It was great waking up to find Eversave deposited $5 in my account! 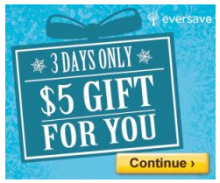 Now through December 8th, Eversave is giving all members a $5 holiday credit into their accounts! With this $5 credit, you’ll definetly want to check out their deals. If you are new to Eversave.com, head over there and check out their deals! No-spill food containers and more from Lock n Lock $23 for $50 now $18! Are you new to Eversave? Or have you been using them for a while now? Eversave is giving all of us a little something. They’re giving a $10 credit for all new sign ups, Plus anyone who is already using Eversave will have a $10 bonus credit in their account! This $10 credit will need to be used by August 25th. We use a monthly flee preventative for our dog and it can get really expensive. If you’re like me and hate paying full price for pet care items, head over to Eversave today and get $10 for $20 to PetCareRx.com. If you are new to Eversave, sign up now. It’s free and easy. Plus you’ll get a $2 credit if you are a new Eversave member making this deal only $8! Also if you spend $70 when redeeming your voucher, you’ll earn $10 in Save Rewards. 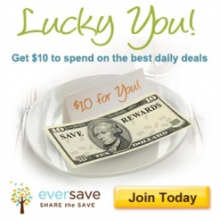 Eversave also has a great referral program and an “Eversave Pledge” on all deals! 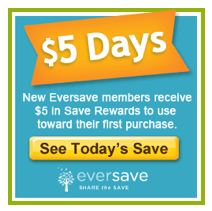 If you are new to Eversave, sign up and you’ll get a $5 credit your account. Eversave is another really great daily deal site. Plus, they have a $10 referral program. This is a great daily deal site, I’ve actually used them quite a bit in the last few months. Eversave has deals for everyone. You can get gourmet foods one day and kids clothes the next! Head over to Eversave and check them out! Don’t forget to tell your friends. This offer ends on April 13th! Daily deals Apr 11, 2011 in Eversave · Expired!